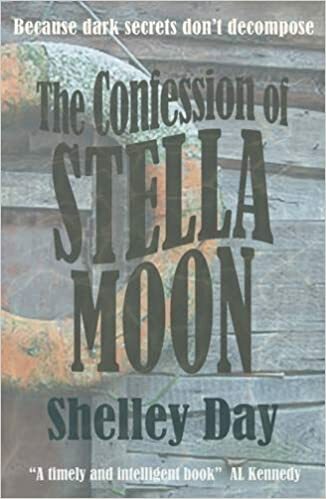 This book begins with the Stella Moon’s confession to the police that she killed her mother. So we know from the beginning who killed Muriel and how, but we don’t know why. Even Stella doesn’t really know why as she has gaps in her memory. In this dark story, Shelley Day takes us back to the boarding house where Stella was brought up and starts to reveal all that has happened leading up to the murder of her mother. Shelley has brilliantly created a really dark and foreboding atmosphere throughout the book from the old boarding house itself, to sleazy Frank, to the taxidermy of Stella’s mother. As Stella gradually finds out about her past and the secrets concealed in that creepy old house, I could quite understand why she had blanked out so many of the awful memories. Trepidation pervades the storyline making the reader feel very uneasy throughout. Stella has not been surrounded by the love and care she should have expected from her family. Her mother seems to have been really quite a disturbed person and rejected her daughter leaving her open to abuse by others who should also have been caring for her. Stella is a very intriguing character who seems to draw people to her. Gareth her probation officer is both fascinated but also slightly repelled by her. She has made a good friend in prison in Marcia, her support worker and it was good to see that Stella had at least one person who wanted her to go on to succeed in life. Well she had more than one, as I wanted her to have the chance to make a new start too. She deserved it after all she had been through. This is a very intelligent debut novel, dark and brooding but very compelling. I have met the author Shelley Day – who is not at all dark and brooding! – and I think she was worried that people may not take to Stella. I expect most debut authors worry their books may not be well received. She needn’t have worried, this is an excellent first novel and I’m looking forward to reading what Shelley writes next. 1977: A killer is released from prison and returns home to a decaying, deserted boarding house choked with weeds and foreboding. Memories of strange rituals, gruesome secrets and shame hang heavy in the air, exerting a brooding power over young Stella Moon. She is eager to restart her life, but first she must confront the ghosts of her macabre family history and her own shocking crime. Guilt, paranoia and manipulation have woven a tangled web of truth and lies. All is ambiguous. Of only one thing is she certain… Stella Moon killed her own mother. Wow I do like the sound of this one which hadn’t crossed my path until your great review – it’s going on the wishlist now. Yay! Always nice to hear someone wants to read a book after reading one of my reviews. Hope you enjoy it.